This is totally what Pharoah looked like back in the day. Episode 19 is now available on Jewcy! This month, Rabbi Joshua Yuter joined me as we read chapters 42-44. When we started, Joseph was stuck in jail. 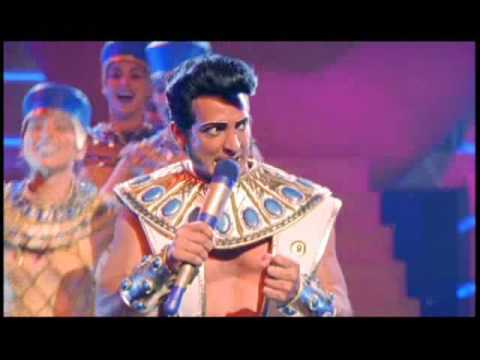 By the end of the episode, through some very unlikely dream analysis, Joseph ends up running the show in Egypt. Along the way, Rabbi Yuter and I discussed an Orthodox approach to Biblical criticism, what Pharaoh’s birthday parties must have been like, and alternate analyses of Pharaoh’s dreams. At that point, people saw dreams as either telling about a thing that had happened, reflecting a thing that’s going on right now, or as predicting the future. And people immediately say “OK what does this dream predict?” Which is not something that we do. Now we tend to think of dreams as reflecting a vulnerability, reflecting our unconscious. So I thought about that and tried to figure out what, if we were to use that kind of analysis, what Pharaoh’s unconscious might be saying. What was Rabbi Yuter’s analysis? Listen to find out. But not here! Head on over to Jewcy.com to listen there, the ONLY place on the Internet you can get new episodes of OMGWTFBIBLE. Until tomorrow. This entry was posted in Live Shows, Media, News and tagged bible, comedy, dreams, egypt, freud, funny, humor, jewcy, joseph, josh yuter, jung, lol, omg, pharaoh, rabbi yuter, religion, wtf, wtf podcast by omgwtfbible. Bookmark the permalink.